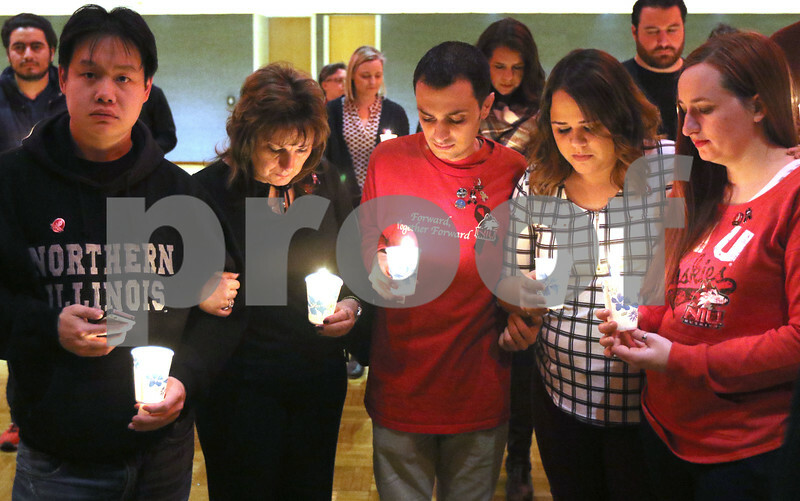 Attack survivor Harold Ng, (left to right) Eva Korellis and son survivor Patrick Korellis, survivor Lauren Carr, and survivor Amy Workman take a moment to reflect Friday Feb. 9, during the candlelight vigil in the Duke Ellington Ballroom at the Holmes Student Center on the campus of NIU. Attendees lit candles in honor of those affected by the events of Feb. 14, 2008 and reflected on the healing and strength of the community since that day. The vigil is just the start of events scheduled to mark the passage of 10 years and honor the lives of the five students lost.